About Map: Map showing where is Sao Tome and Príncipe located in the World. 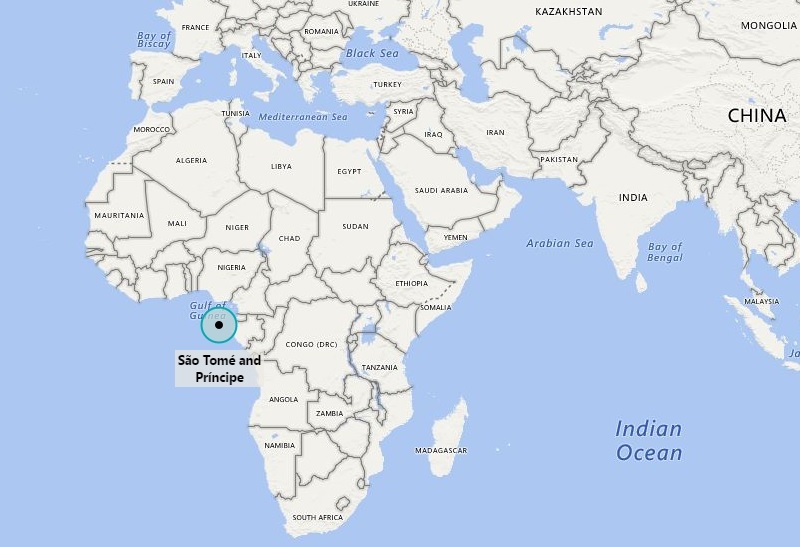 Sao Tome and Príncipe location map shows that Sao Tome and Príncipe is located in the Gulf of Guinea, Atlantic Ocean. It is exactly off coast of central Africa. It is composed of two islands i.e. Sao Tome and Príncipe. Geographically, both islands are the remnant part of extinct volcanic mountain range. In terms of population, it is second-smallest country of Africa continent. The language of Sao Tome and Príncipe is Portuguese. The government type of Sao Tome is Democratic semi-presidential Republic featured with multiparty system. Under this system, the president of the republic is elected for a 5-year term by direct universal suffrage. The economy of the country is largely dependent upon the agriculture and important produce is cocoa (90 % of total agriculture production), others are copra, palm kernels, and coffee. Fishing is other economic activity that people exercise. Above all, tourism is also increasing in the country and hence becoming another source of earnings.